Dr Schimmel Spider Mite Terminator can be used safely throughout every stage of plant and crop cycles, from very young plant stage, right up to the harvest period. 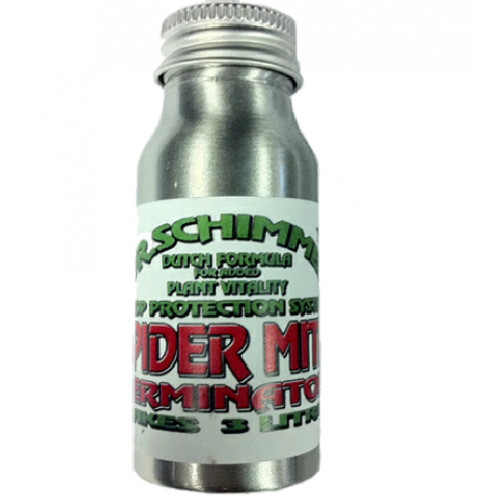 DR Schimmel Spider Mite Terminator begins working from the first moment you use it. Each bottle contains 3 key ingredients to complete the treatment effectively and must be mixed as one solution in the appropriate amount of water, i.e. DO NOT USE 10ml to make 1 ltr. You can use this as either a preventive drip or as a spray remedy. It is easy to use and comes in 3 handy sizes.